Control syringes are a special style of syringe that include finger and thumb rings that are attached to the barrel's proximal end and to the plunger's tip. This allows the syringe to be used with one hand. They don't require as much force to use- leading to smoother & easier injections and aspirations. Most control syringes include transparent polycarbonate design to visualize air bubbles, split collar retention, large tip lumens, and can include reservoirs that prevent bottoming out during the injection. There are several popular control syringes on the market today- let's take a look at them and see how they compare. How do control syringes work? ​A control strange is just one of many different types of syringes on the market today. Other types of syringes include insulin syringes, safety syringes, nasal syringes, & oral syringes which do not have a needle. Using a control syringe isn't too much different from using a regular syringe except that it will enable you to use it with one hand. Syringes are crucial medical devices that can help individuals deal with medical difficulties- their design & functionality has evolved dramatically over time. What are the elements of a syringe? Generally a syringe is composed of a cylindrical barrel, a tight-fitting plunger, and a hub where the needle is attached. They can come in a variety of different sizes, generally ranging from 5 to 60 mL. 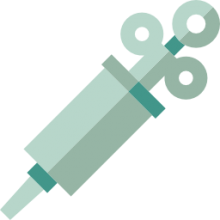 Syringes that are between 1 to 3 mL are typically adequate to provide injections subcutaneously or into the muscle, which is known as an intramuscular injection. The syringes that are above 3 mm in size are generally used to supply medication into intravenous lines as well as for wound irrigation. Syringes can be either Leur-Lok or non-Leur-Lok. The former have tips that need needles to be twisted and then locked into place. This is advantageous because it will prevent the needle from slipping out of the syringe. The non-Leur-Lok Syringe will have tips that can be pressed into place rain then being twisted. Regarding the different types of needles- they are generally distinguished by their diameter and length. Needle width typically varies between .5 to 3 inches. The needle diameter is typically assessed in gauges. For example if a needle has a 25 gauge it will have a smaller diameter than the one with a 19 gauge. Needle gauge and average range of between 7 and 33, which is the smallest. Choosing a needle gauge that is appropriate for you will depend upon the medication's thickness. Thicker medications will require smaller gauge and bigger diameter needles. If you're looking to purchase a quality control syringe, review the options we have collected in the comparison table at the top of the page. Make sure that you do your homework- after clicking through to the product page of a particular control syringe make sure you understand the warranty information and any other medicinal miscellany that could be relevant to making an informed decision about the control syringe you're going to purchase.